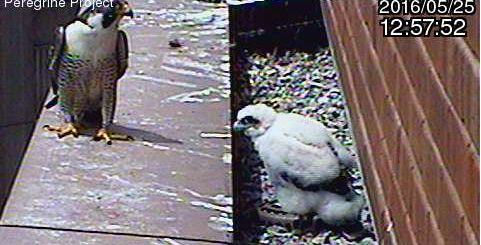 For a couple of weeks we knew that she would be an only child, though no-one knows why the other three eggs didn't hatch. Earlier today, the chick was picked up and weighed and banded and named. At 953grams, she is a big youngster. She has a red band on her right leg for easy identification. Meet Ancaster, named for the city (now amalgamated with Hamilton) that was settled in 1792. 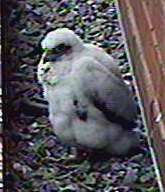 I'm not certain, but I believe she is the 48th hatched peregrine from the Sheraton Hotel. She is a big girl! We have an Ancaster Drive near us.